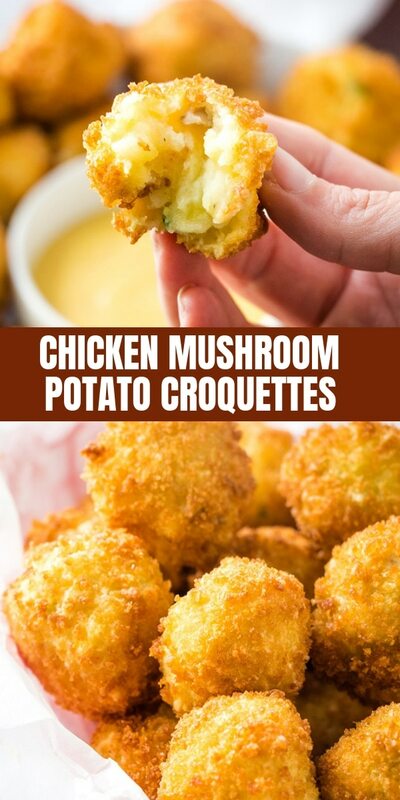 Chicken Potato Croquettes with shredded chicken, mushrooms, and mashed potatoes in a golden-crisp bread coating are a tasty appetizer or snack everyone will love. 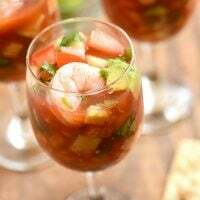 Perfect use for your holiday leftovers! 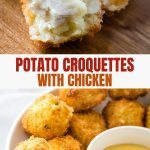 These chicken potato croquettes are definitely on the top of my “entertaining” food list, especially during the holidays when potato mash seems to be a part of every menu. 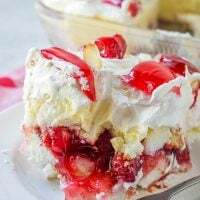 Not only are they a guaranteed crowd favorite with their fluffy centers and golden-crunchy coating but they’re also customizable and a great use for leftovers. 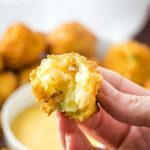 Roast chicken, mashed potatoes, and garlic mushrooms are one of our staple dinner combos at home, and although it’s only G and me, I usually make more than we can comfortably consume in one meal and use the leftovers into these chicken potato balls. Just a few minutes of mixing them, rolling into spheres, and coating in breadcrumbs and we get another tasty dish to enjoy the next day! And we all know how excessive our Thanksgiving or Christmas feasts can get. 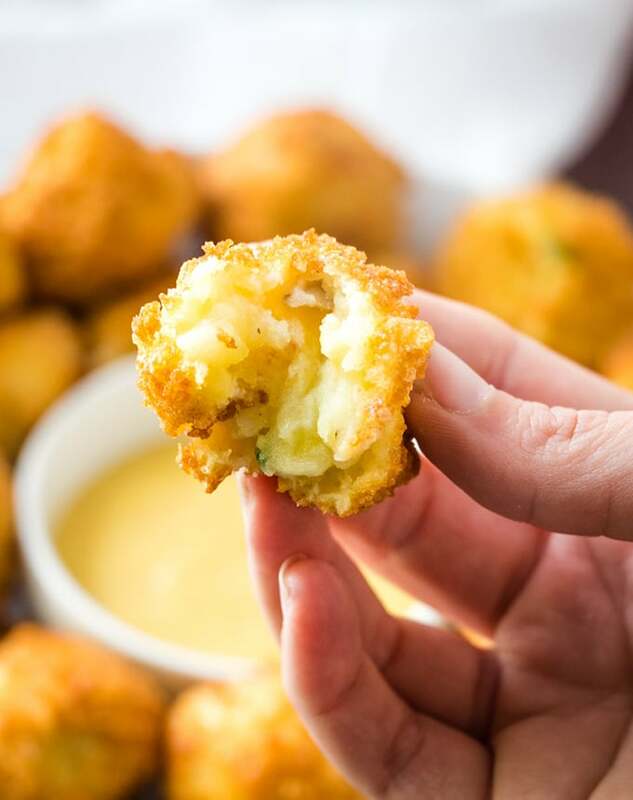 Mashed potato croquettes are a creative way to breathe new life to leftovers that would have otherwise gone to waste. Save those turkey meat scraps and swap them for the chicken called for in the recipe. Have extra green peas or carrots? Throw them into the mix, too! 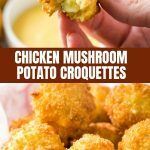 We love our croquettes with shredded chicken and mushrooms but you can easily make them your own and add or swap whatever ingredients you have on hand. 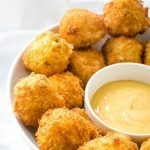 You can try these loaded potato balls or check out a few ideas below. Chill the potato mixture for a few minutes or until completely cold to make shaping easier. 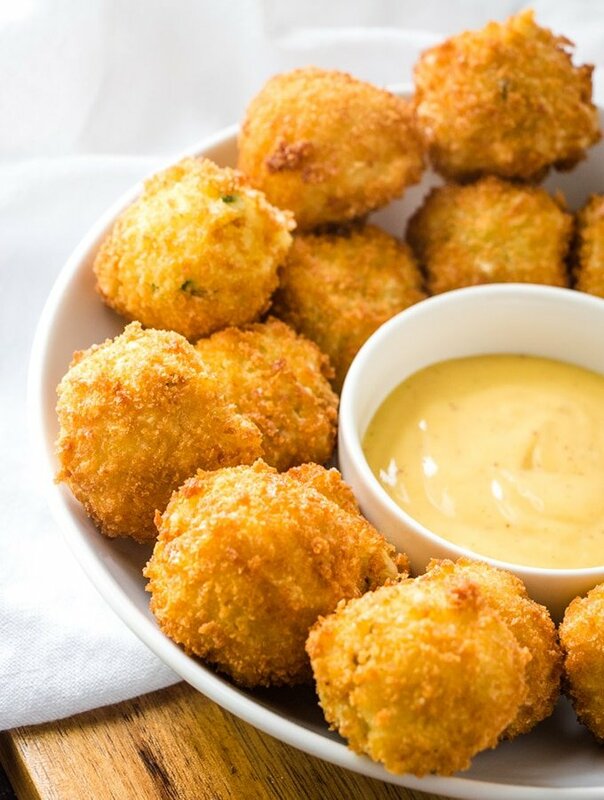 Use a scoop to evenly portion the croquettes and roll between the palm of hands into a smooth ball. If the mixture is sticking, lightly dust hands with flour. Although you can use regular breadcrumbs, I highly suggest Panko bread crumbs as they tend to absorb less oil and result in crispier and crunchier texture. For the best crisp, use oil with high smoke points such as safflower, grapeseed, canola or corn oil. Deep-fry in enough oil, about 2-inches deep to cover the balls at least halfway. Maintain an optimum frying temperature of 350 F to 375 F. Do not overcrowd the pan and fry in batches as needed. 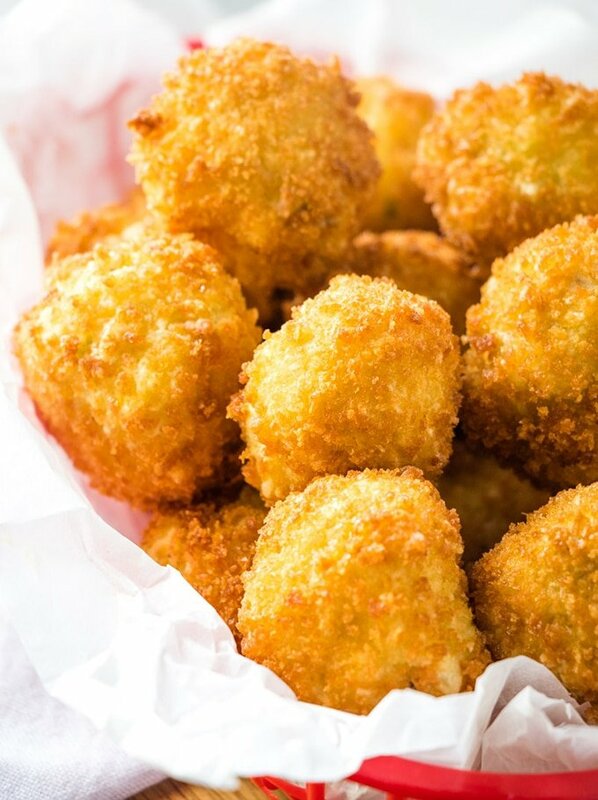 Drain the croquettes in wire rack instead of on paper towels as the steam will make them soggy. 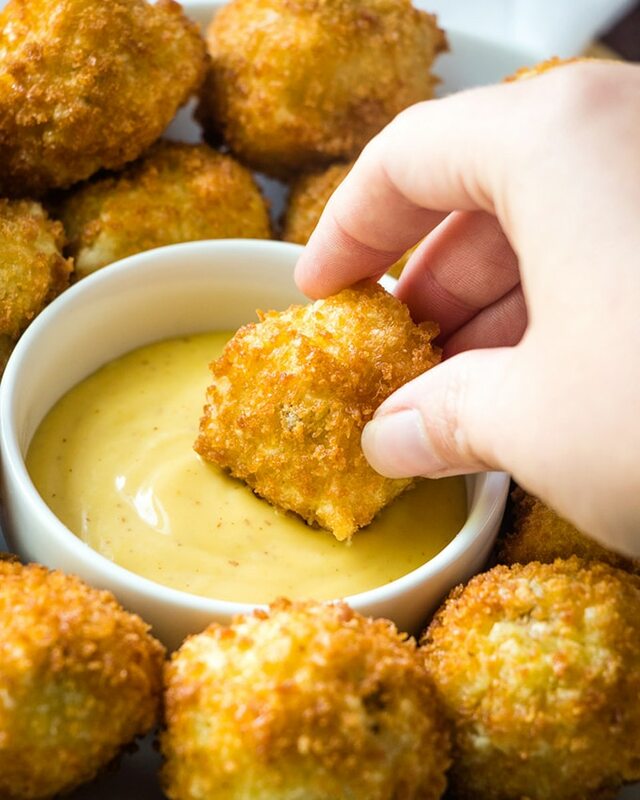 Arrange the breaded balls in a single layer on a baking sheet. 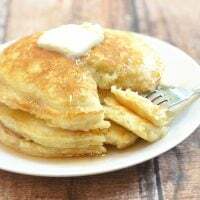 Drizzle with melted butter or spray with cooking spray. Bake in a 400 F oven for about 15 to 20 minutes or until golden and crisp. Can You Freeze Potato Balls? Yes, you can! 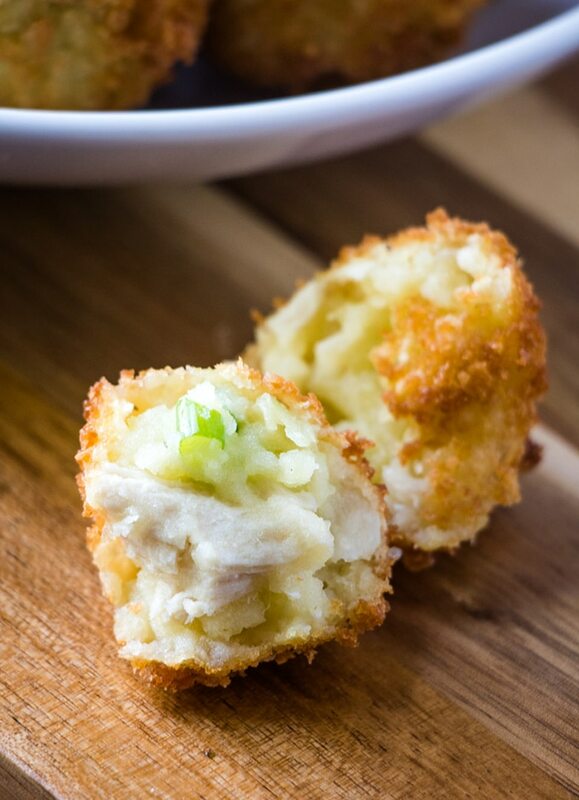 The potato balls can be frozen for future use either before or after deep-frying. Arrange in a single layer on a baking sheet and freeze until firm. Transfer to a resealable bag or airtight containers and store in the freezer for up to 3 months. Wash potatoes of any dirt and grime. In a saucepan, place potatoes and enough water to cover. 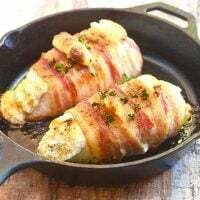 Bring to boil, reduce heat to a simmer and cook, covered, for about 15 to 20 minutes or until they can be pierced with a fork without resistance. Drain from water and allow to cool to touch. Peel skin and place in a large bowl. In a pan, heat about 1 tablespoon of oil. Add onions and mushrooms and cook until softened. Remove from pan and keep warm. Using a potato masher or a fork, smash potatoes until smooth and without lumps. Add milk and butter. Season with salt and pepper to taste. Add sauteed mushrooms, chicken, and green onions. Gently stir until well-distributed. Form about 1 tablespoon of potato mixture into balls. 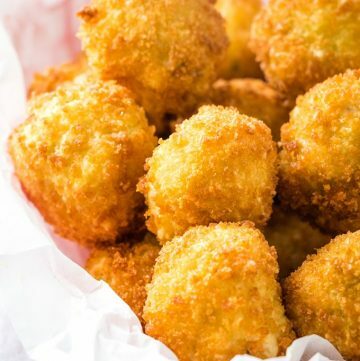 Dredge potato balls in flour, dip in egg and roll in panko bread crumbs. Cover the mixture with plastic film and refrigerate for about 20 minutes or until completely cold. 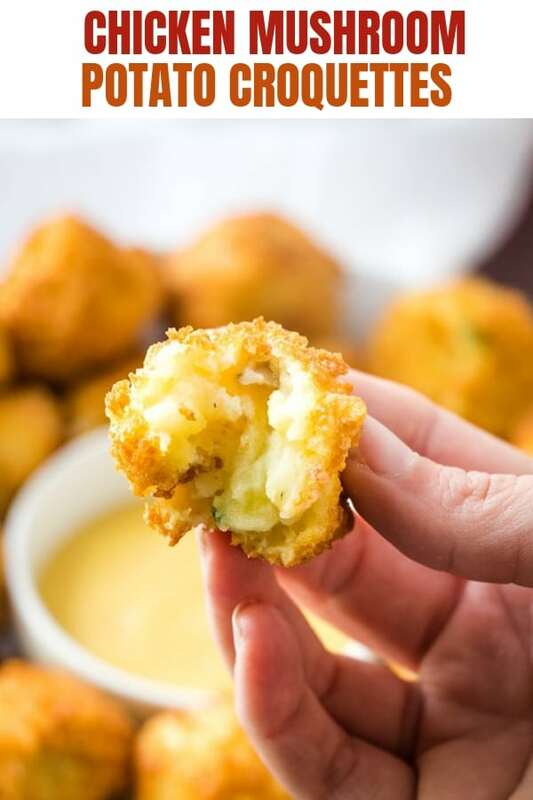 Using a small scoop, portion mashed potatoes into 1-inch balls and between the palm of hands, roll into round shape. Place flour on one plate, eggs in a bowl, and Panko breadcrumbs in another plate. 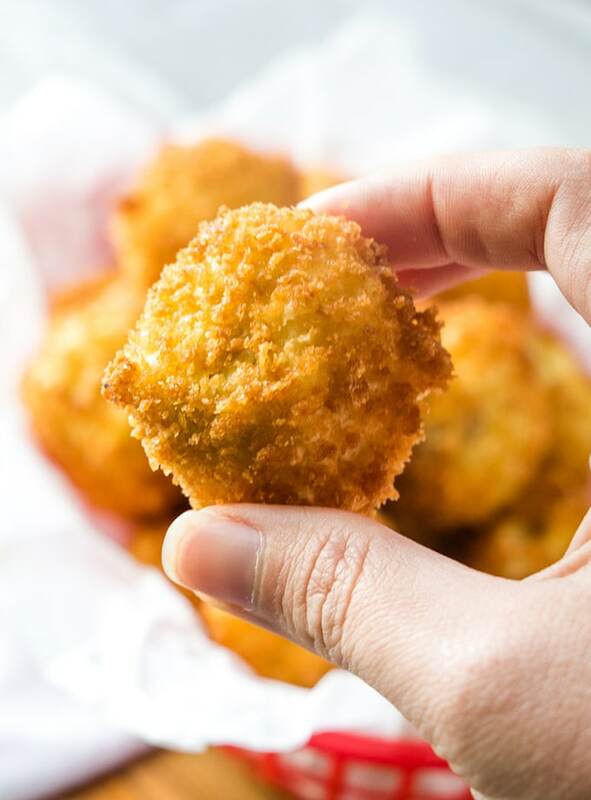 Working one at a time, dredge potato ball in flour, shaking off any excess flour, dip in egg, and then roll in Panko, gently pressing down breadcrumbs to coat. In a pan over medium heat, heat about 2-inch deep of oil to 350 F degrees. 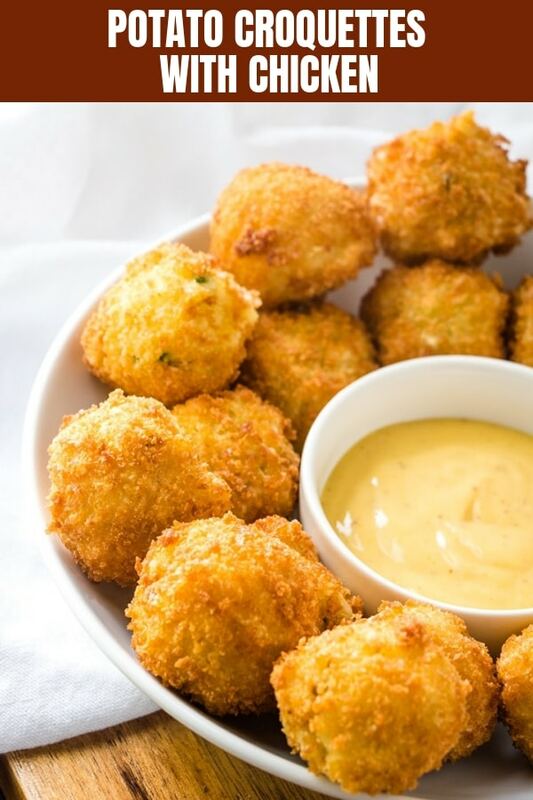 Gently add potato balls into hot oil and deep-fry, turning once or twice, until golden brown and crisp. Cook in batches as needed. With a slotted spoon, remove from pan and drain on a wire rack. Serve immediately with dipping sauce of choice. Nutritional info calculated at 2 croquettes per serving.